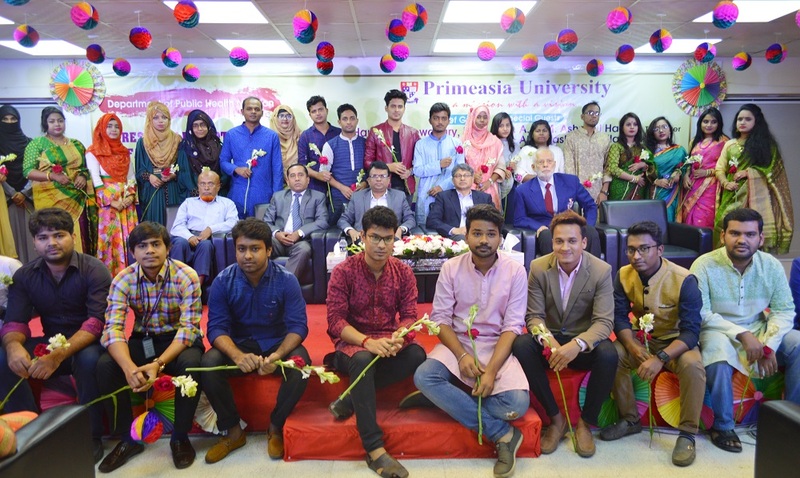 The Fresher’s Reception & Farewell Program for the newly enrolled students of Fall Semester 2018 and Farewell Program for the outgoing students of Public Health Nutrition (PHN) department of Primeasia University held on Saturday, December 01, 2018 at its IQAC Conference Center of its campus Banani, Dhaka. Prof. Dr. Abdul Hannan Chowdhury has graced the Program as the Chief Guest. Mr. A. K. M. Ashraful Haque, Treasurer of Primeasia University was the Special Guests while Prof. Dr. A. J. M. Omar Faruque, Dean, School of Biological Science of the University was present in the program as the Guest of Honor in the program. Dr. Md. Abdus Salam Mondol, Head, Department of Public Health Nutrition (PHN) of Primeasia University chaired in the program. Among others, Prof. Dr. Suvamoy Datta, Head, Department of Microbiology, Faculty members, Guardians and students of the department of Public Health Nutrition (PHN) of Primeasia University were present in the program. The Program was ended by cultural events along with songs, dances, poetry and drama performed by the students of the department.